The PHP-190 Series has been discontinued. Please see the PHP-300/400/500 Series as a possible alternative or contact our Flow Engineering department. 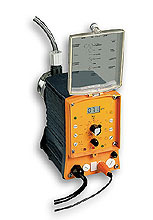 The PHP-190 Series of chemical metering systems are unique instruments that combine a pulse frequency controller with a diaphragm-type pump in one compact unit. In the control mode, deviations from setpoint are converted to pulses which vary the stroke rate of the metering pump. As the setpoint is approached, the pump feed slows down to minimize chemical loss and overshoot of the endpoint. Variation of the stroke rate is controlled by a front panel potentiometer or through process controlled operation by external electric or mechanical pacing or by closed loop control. The units are supplied with foot valve, injection valve, power cord, and a float level switch made of polypropylene with a 1.8 m (6') polyethylene-coated cable. For proper control, a holding tank with a minimum 10-minute residence time is required.